House cleaning crew Jacksonville. FL. Contact us when you need house cleaning or maid service in Jacksonville, FL. When you compare the time involved, equipment and supplies expense in comparison to our one time house cleaning cost it’s really an easy decision to call us. 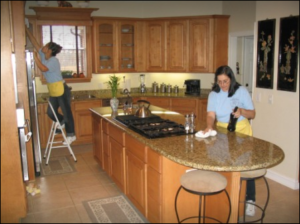 Cleaning service prices depends on many factors so It’s best to give us a call. We don’t cut corners, we dust and clean them – whole house clean! Daily, weekly and monthly whole house cleaning services. Be sure and read our spring decorating tip below. For those needing springtime home decorating ideas and inspiration I hope this has helped. If you haven’t found some outstanding suggestions above I at least hope that you will have been inspired to find your own fabulous finds for spring decorating. Contact Clean Master Services when you need maid or house cleaning services in or around the Jacksonville, FL. area.